As you may have noticed, the ongoing viral campaign started with “Operation Early Bird” for Christopher Nolan’s final chapter in his Batman franchise, “The Dark Knight Rises,” which led to the screening of a six-minute prologue which was an introduction of Bane. While that has yet be officially available online, we have something that is just as epic: the second trailer. It’s official, fanboys: We have something really exciting to look forward to next year. The thing that hyped me up the most was the fact that Selina Kyle (Anne Hathaway) was finally shown in this trailer, and with the little dialogue we heard, I have a feeling that Hathaway will do a great job portraying the iconic “is she an ally or adversary” personality that is Catwoman. The incredible and astonishing action we saw on Pittsburgh’s Heinz field is just one piece of how terrifying Bane (Tom Hardy) will be for the citizens of Gotham City and to our Dark Knight as well. We got a small peek on the fights between Batman and Bane, and the situation that we saw Wayne in, which reveals to us that just like in the comic book series “Knightfall,” Bane will once again be aware of the caped crusader’s true identity in addition to breaking out all of Gotham’s prisoners. 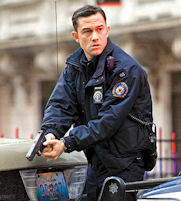 It was a shame that we didn’t get a single line from John Blake (Joseph Gordon-Levitt). I’m still convinced that his role will be bigger then we all think. Something that I noticed in the trailer was that Wayne was seen hobbling with a cane, which is another sign of a possible “Knightfall” allusion that Gotham’s protector is really in for it against Bane. What bothered me in this trailer — and I hate that I’m saying this — but it was really difficult to hear what Bane was saying at all. It has nothing to do with Hardy, he has an amazing voice and I totally love his British accent, it’s the mask that is causing the problem. It’s possible that it was the point from the start. Although the mask makes it hard for me and I assume a majority of people out there to hear, the voice does sound more intimating and that is what Bane is supposed to both sound and look like. Hopefully, Nolan will take this feedback from almost every news site that has seen both this trailer and the prologue, that maybe he should consider some sort of voice over with Hardy to perhaps just make it a little more clear what Bane is actually saying. Other than that, I was fascinated by this trailer and my opinion that TDKR is going to be the ultimate and exceptional ending to Nolan’s Batman story has not been changed. “The Dark Knight Rises” — starring Christian Bale, Michael Caine, Gary Oldman, Morgan Freeman, Anne Hathaway, Tom Hardy, Marion Cotillard and Joseph Gordon-Levitt — will be out in theaters on July 20, 2012. In the meantime, I want to hear what you thought of the trailer, you know what to do – hit with your comments to the right. I agree, this trailer was a great first look at the film. I was privileged to see the prologue in an IMAX theater last week, so with that footage and this remarkable trailer the movie is looking to be pretty epic. 2012 is going to be one of the biggest years for amazing films.